With the aging of the population, there will be an increase in the number of older adults diagnosed with cancer. Little is known about the characteristics of older newly diagnosed cancer patients who refuse cancer treatment and how often they refuse. The aim of this paper was to describe the health and functional status characteristics of patients who refused cancer treatment. 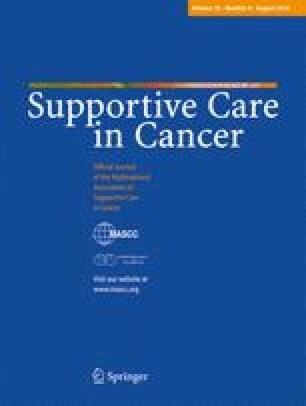 A prospective pilot study on health and vulnerability in older newly diagnosed cancer patients was conducted in the Segal Cancer Centre, Jewish General Hospital, Montreal, Canada. One hundred-twelve patients agreed to participate (response 72%). Health and functional status were assessed during the baseline interview; information on cancer treatment was obtained from the medical chart at baseline, 3 and 6 months follow-up. Descriptive techniques such as frequencies and means were used to describe the health and functional status of patients who refused treatment. Of the 112 participants, 17 (15.2%) refused cancer treatment partially or completely. Of those 17, 15 were women and 2 men. Fifteen participants refused a part of their treatment upfront. Two refused all further treatment after severe toxicity. The majority of participants refusing cancer treatment were women with breast cancer and they mostly refused adjuvant chemotherapy. Participants who refused often lived alone, were less often married/living common-law, had activities of daily living disability, and often had early disease. The majority of older newly diagnosed cancer patients underwent the recommended cancer treatment but partial or complete cancer treatment refusal in older newly diagnosed cancer patients was not uncommon. We thank all of the participants who gave of their time during a very difficult period of their life to participate in our study. In addition we very much appreciate the support of staff and volunteers of the Segal Cancer Centre. This study was supported through a post-PhD research fellowship of the Canadian Cancer Society/National Cancer Institute of Canada to Dr. MTE Puts. The study was sponsored Solidage McGill University/Université de Montreal Research Group on Frailty and Aging and the McGill Dr. Joseph Kaufman Chair in Geriatric Medicine.